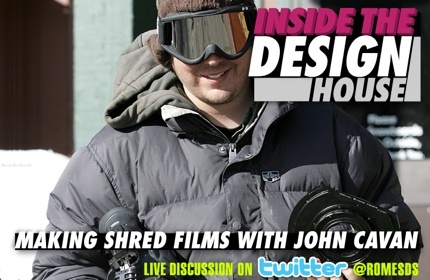 One of our favorite snowboard filmmakers & former EB Worcester employee, Rome’s John Cavan, will be up for a live Twitter Interview on Friday September 4, 2009. Ever wonder what actually goes into making a snowboard video? Well, wonder no more, or at least no more after this Friday September 4th, when Rome’s John Cavan, (Rome Team Manager, Filmer, Editor, Red Bull hoarder, video guy and at least a half a dozen other things on his business card) will be sitting down for the first “Inside the Design House Twitter Interview”. Cavan got his start in shred flicks making the “Iron Curtain” East coast video series. From there he headed west to work with the Grenade crew, and has ended up here at Rome where he’s been traveling the globe with the Rome team filming and editing films like Any Means, No Correct Way, and A Hard Days Night. So get your questions ready. How does he choose the music for the videos? How is it traveling with MFR, LNP and Bjorn all season? Have you ever blown the shot? Why do you love snowmobiling so much? How often do you deal with the cops while filming hand rails? And as always, the Rome SDS will be hooking one lucky random tweeter who tweets in a question with something awesome. A spankin’ new pair of Rome Libertine snowboard boots. Because nothing keeps your feet warmer while filming a handrail in Québec, at night, in -15 degree weather, while ducking the cops. 4. Cavan will fire back his answers to your questions. Come up with some good questions and fire them Cavan’s way for a chance to score a new pair of Libertines, right before the snow starts flying. Bring some snacks, and make sure you go to the bathroom before it starts, no bathroom breaks. Stay tuned to www.romesnowboards.com as well as www.twitter.com/romesds for more updates on the happenings of the SDS as well as the announcement of when and with whom the next “In the Design House” or “Ask the Rider” interview will be going down.